An 11-year-old boy found dead along with his mother, brother and sister at their home in Greater Manchester had been beaten to death, tests show. 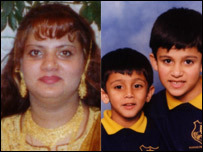 Police believe the four bodies found in Cheadle Hulme are those of Uzma Rahan and her three children - Adam, 11, Abbas, eight, and six-year-old Henne. An international manhunt is under way for Rahan Arshad, who is believed to be the husband and father of the victims. 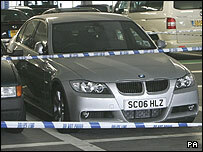 The 36-year-old's BMW 320 diesel car has been found at Heathrow Airport. Officers are making inquiries with the airport and airlines to establish if Mr Arshad had travelled from there recently. The car, which had been parked at Heathrow for several weeks, is being transported to Greater Manchester for forensic examination. Although the victims have not officially been identified, police believe they are the occupants of the house on Turves Road. A post-mortem examination carried out on Tuesday revealed that one of the victims, who is believed to be Adam Arshad, died from head injuries. The results of tests on the other three bodies are expected to be released on Wednesday. Their bodies were found on Sunday night after neighbours became concerned about the family. Police had been called to the house last Friday but when officers first called they believed there was no "immediate concern" for the safety of the family. Neighbours got back in touch with police after noticing a smell coming from the home. The children's head teacher at Bradshaw Hall Primary School said staff and pupils were "shocked and saddened." Jill Lowe said the siblings were "lovely, cheerful children" who were "a joy to teach". Uzma Rahan worked as a lunchtime organiser in a school canteen, police said. The family had lived in Turves Road for 18 months. Det Supt Martin Bottomley appealed to Mr Arshad, a local taxi driver, to get in touch with police or for anybody who has seen him to contact them. "We are concerned for his welfare. We are treating it as a murder inquiry, therefore we need to speak to him," he said. "There are a number of strands to the inquiry but the most immediate one is to trace the whereabouts of Mr Arshad. "We have alerted every police force in the country. We want to speak to him in relation to the horrendous events in the house." Neighbours said that the family had not been seen for several weeks. Det Supt Bottomley added: "The bodies may have been lying there for up to four weeks and you can imagine in the hot weather we have been faced with a devastating scene." 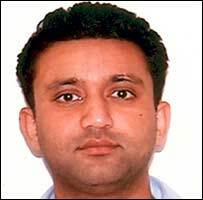 British-born Mr Arshad is known to have a large extended family both in the UK and Pakistan, and Greater Manchester Police said they had been liaising with police forces abroad. Searches by scenes of crime officers are continuing at the house. A formal identification of the bodies could take some time, police have said.